As most of you are aware, your Range Rover has a power steering system. How are you aware? You are aware because of the puddle of power steering fluid you have under the front of your Range Rover. If you don’t have a leak in the power steering system, YOU WILL. I have had one kind of leak or another in the power steering system since I purchased her in Summer of 2000. I have replaced a hose or two in the vain hope I was finding the problem. Eventually you give up mostly because your daily driver can’t go without having hoses up there. And what’s a little fluid leak if you can keep up with it with the occasional refilling of the reservoir. 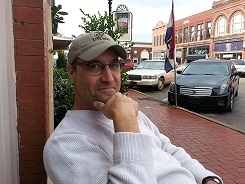 Well eventually you will move into a new house and that leak staining the driveway will upset your spouse. Mrs. OkieRover asked me what that dark spot was under the Range Rover. I was embarrassed to tell her, “that was there when we bought the place. Damn that builder!” So was not amused at my quip. This brings me to this round of restoration and my mission to fix ALL the leaks this time. I was sure I had a bad hose or failed hose. When you look at most of the hoses in this system you are likely to see some protective wrap. That wrap is all fine and good and I’m sure it has a good purpose. I’m not sure what the purpose is…but it is excellent at hiding the location of a leak. 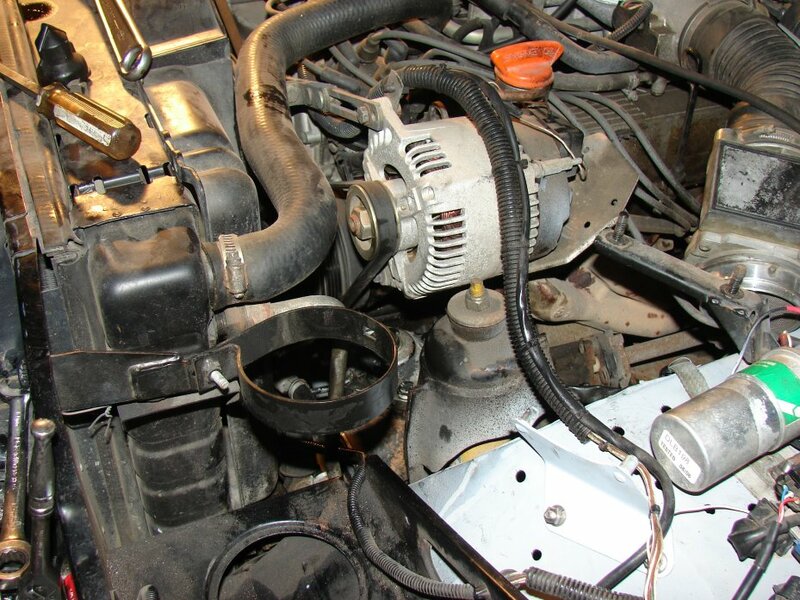 I started the project by removing the power steering reservoir and the air filter assembly. They are in the way for the most part when you are trying to get to the hose connections. They are easy to remove and will make your life easier on this job. You are going to remove four hoses. Two connect to the power steering pump. And two additional hoses that are connected to each other and labeled pump to box. 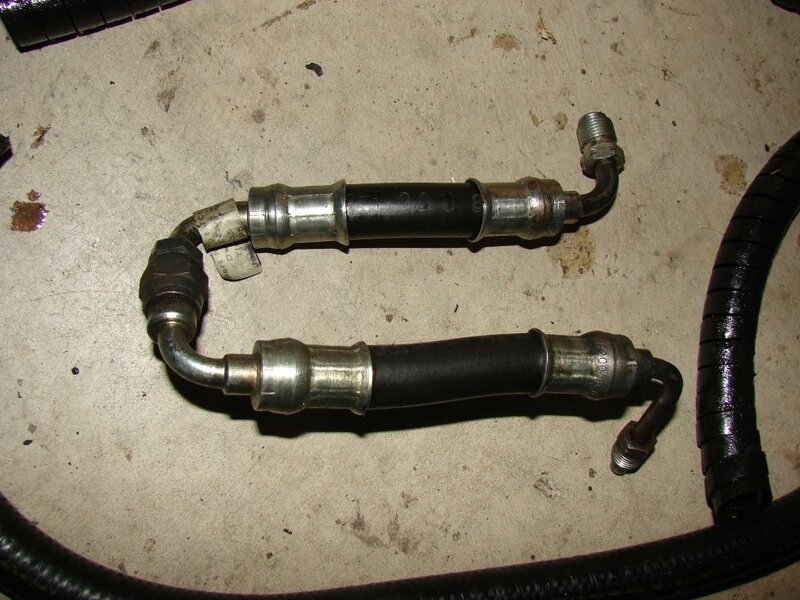 Why they needed two hoses to connect to each other instead of just one hose is a question perhaps only an engineer could answer. But since they all died from liver failure from the booze they drank while designing this vehicle we may never know. There are two low pressure hoses. They are low pressure because they are held in place by a hose clamp. If they had metal fittings on each ends you would know they were high pressure hoses. I’m going to replace both of these hoses. 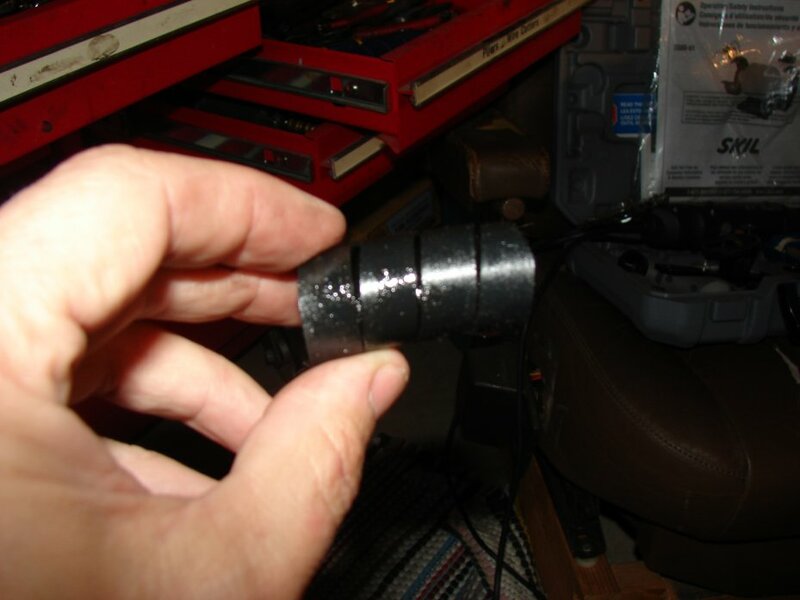 The one with out any pressure fittings is just a rubber hose. 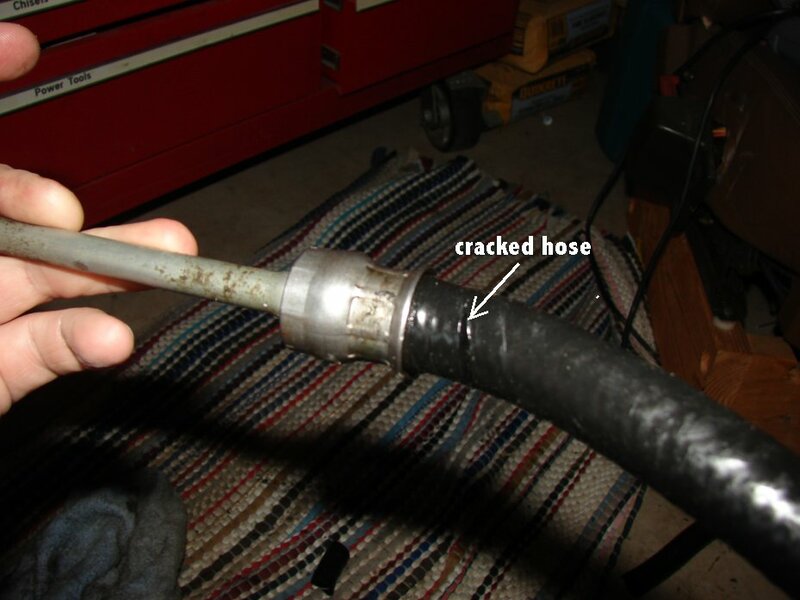 Rubber hoses are prone to failure as you already know. 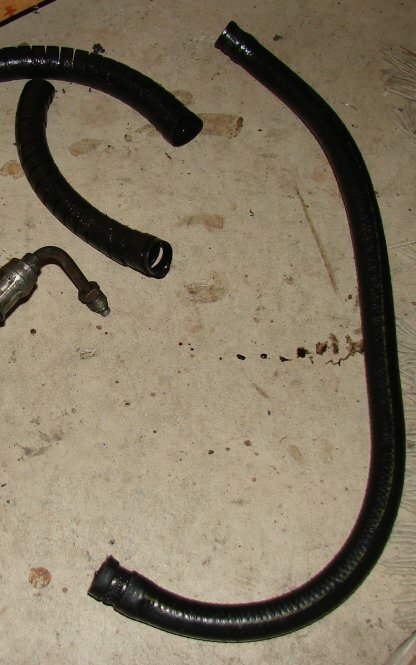 Rubber hoses have been failing ever since they were put on the first cars in the 20th century. Land Rovers are no different. This is a picture of the top of the power steering box. It shows where the hoses connect to the box. It lower hose is the one I have a crack in. This crack was hidden by the protective wrap I talked about before. With the wrap in place the leaking fluid covered the entire hose and dripped from every separation. This made the entire area underneath wet with power steering fluid which contributed to the mystery of the leak. I have to note here that a pressure fitting on the side of the pump was also loose. I’m not sure how it got that way or if any fluid was leaking from it. But it was interesting to mention. When the hose was in its installed relaxed position the crack was closed which led to weeping of fluid and not an active dripping. With the hose covered with protective material, it would not have dripped anyway. So I got online and ordered one from Atlantic British. I also ordered a few other items but did not get to the free shipping special. I couldn’t justify buying 60$(US) more stuff to save 12$(US) in shipping. There may have been one or two more items but I couldn’t remember them. When the get it all in I’ll reassemble the steering system and take the Range Rover down for a hot wash of the area that was formerly wet with power steering fluid and then another check for leaks. I’m confident I have found all the leaks but you can never really know for sure. When you have a British automobile you either have a leak or you are out of fluid. There is no in between. 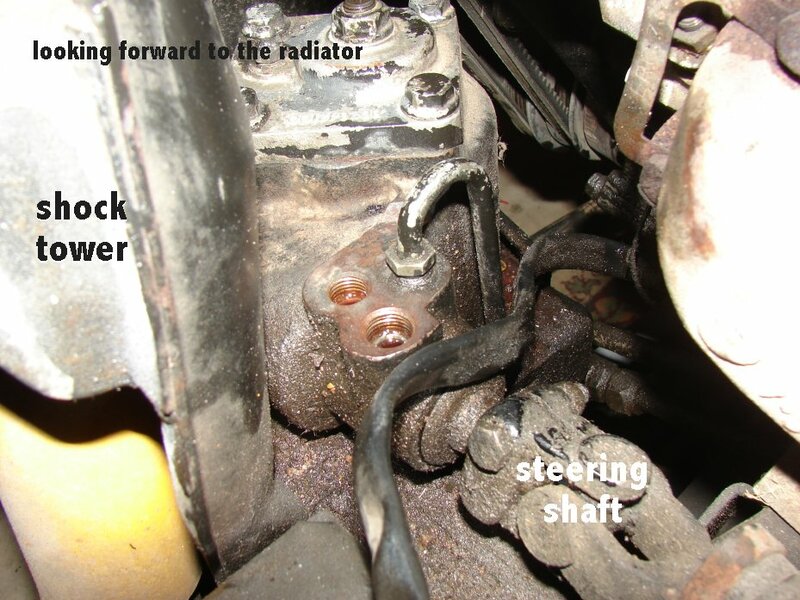 This entry was posted in hoses, Mrs. OkieRover, power steering, restoration. Bookmark the permalink.